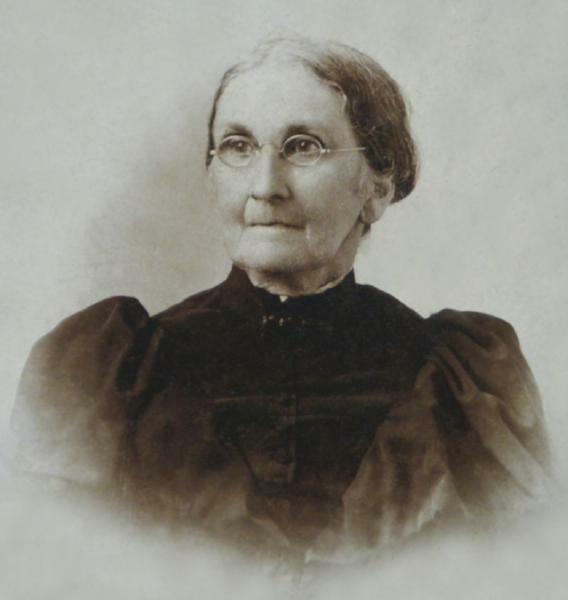 Sarah Ann Wilds Gillespie was born on 26 June 1821 in South Carolina. Sarah already was an accomplished artist and musician as a young woman, and a few of her watercolor paintings of flowers are treasured by her descendants. She married Benjamin Franklin Pegues, son of James Pegues and Jane Johnson, on 25 May 1843, and Sarah's sister Nancy married Benjamin's brother Rufus. Benjamin Franklin Pegues and Sarah Ann Wilds Gillespie appeared in the US federal census of 1 June 1850 in Chesterfield District, South Carolina, enumerated next to next to Benjamin's brother William.. Other members of the household included Julia Mary Pegues, Lucy Pegues, Harriet S. J. Pegues, Sara Olivia Pegues and Nannie Gillespie Pegues. Also in the household was overseer W. C. Knight. Benjamin Franklin Pegues and Sarah Ann Wilds Gillespie appeared in the US federal census of 1 June 1860 in Bennettsville, Marlboro District, South Carolina. Other members of the household included Julia Mary Pegues, Lucy Pegues, Harriet S. J. Pegues, John T. Mason, Sara Olivia Pegues, Nannie Gillespie Pegues, Mary Elizabeth Pegues, Ella Lee Pegues, Martha S. Pegues, Sue Sparks Pegues and B. Frank Pegues. Benjamin Franklin Pegues and Sarah Ann Wilds Gillespie appeared in the US federal census of 1 June 1870 in Smithville Township, Marlboro County, South Carolina. Other members of the household included Lucy Pegues, Harriet S. J. Pegues, Nannie Gillespie Pegues, Mary Elizabeth Pegues, Ella Lee Pegues, Martha S. Pegues, Sue Sparks Pegues, Samuel F. Pegues and Edmond Waddill Pegues. Benjamin Franklin Pegues and Sarah Ann Wilds Gillespie appeared in the US federal census of 1 June 1880 in Smithville Township, Marlboro County, South Carolina, and minister William Wroton. Ages of some of the children are off in this census, and it is an educated guess that "Patty" refers to Martha.. Other members of the household included Lucy Pegues, Martha S. Pegues, Sue Sparks Pegues, Samuel F. Pegues, Edmond Waddill Pegues and Maurice R. Pegues. Sarah Ann Wilds Gillespie became a widow at the 9 February 1881 death of her husband Benjamin Franklin Pegues. Cornelius Kollock Pegues appeared in the US federal census of 1 June 1900 in Smithville Township, Marlboro County, South Carolina. Other members of the household included Sarah Ann Wilds Gillespie, Lucy Pegues, Benjamin Franklin Pegues and John Keitt Pegues. Sarah Ann Wilds Gillespie died on 25 April 1904 at age 82 in Marlboro County, South Carolina, at the home of Major Rufus M. Pegues. The following appeared on 28 April 1904 in The State: (Bennettsville, April 27) Mrs. Sarah Ann Wilds Pegues died at the home of her son, Maj. Rufus M. Pegues, in the upper part of this county late yesterday afternoon, at the age of 84. The funeral services were held at New Hope cemetery this afternoon. Mrs. Pegues was the wife of the late Col. B. Frank Pegues, and the mother of Waddell Pegues of Mississippi, Samuel F. Pegues of McColl, Mrs. W. W. Pegues of Pegues, N.C., Miss Lucy Pegues and Mrs. W. D. Evans of Kollock.